Cogmap2's Technical Storage has been irreversibly assimilated by Central Storage, though it maintains some semblance of a partition. For when mass-producing Zoldorfs just isn't enough. Tech Storage is located south of the quartermaster's cargo bay and is accessed through maintenance corridors. It is a place where mechanics can build something useful for the crew instead of making wire art in the chapel. Assistants also get access, which might distract them from farting on the chaplain. A CompTech machine that vends all sorts of computer parts, such as somputer mainboards, storage drives, ThinkDOS disks, ID scanner modules and wired network cards. Maybe it can vend other things? 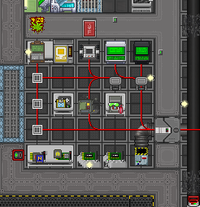 With some technical knowledge and luck, it is possible to create a DWAINE computer with every program on it, or perhaps a station-wide PDA message broadcasting system. Who knows what else might be possible for a skilled player to accomplish? There is no vent. Maybe you could invent a computer that gives you air with the parts in here? 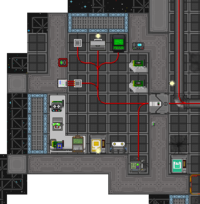 The APC for this room is in the bottom right corner, near the rack of circuit boards. Tech Storage is located next to the medbay in the very port end of the ship and is accessed through maintenance corridors. It is a place where mechanics can build something useful for the crew instead of making wire art in the chapel. Assistants also get access, which might distract them from farting on the chaplain. A CompTech that vends computer mainboards, storage drives, ThinkDOS disks, ID scanner modules and wired network cards. Maybe it can vend other things? 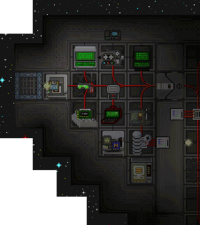 Tech Storage is located below Pathology and west of the rest of Medbay, in the very port corner of the ship, and is accessed through maintenance corridors. It is a place where mechanics can build something useful for the crew instead of making wire art in the chapel. Assistants also get access, which might distract them from farting on the chaplain. A CompTech vending machine with computer mainboards, storage drives, ThinkDOS disks, ID scanner modules and wired network cards. Maybe it can vend other things? A CompTech vending machine stocked with computer mainboards, storage drives, data terminal ports, ThinkDOS disks, ID scanner modules, wired network cards, and other things useful for terminal and heavy computers. Maybe it can vend other things? Lots of data disks and circuit boards for all kinds of Computers. A snazzy portable computer, aka a laptop, cleverly inserted into a suitcase. Network carts and network cards, for various ThinkDOS signal tomfoolery. Tools and equipment such as screwdrivers, optical meson scanners and a flash. A utility tractor/cargo tug, for pretending you're a airport baggage train. A foreign-made GuardBuddy of questionable quality, named Super Protector Friend. 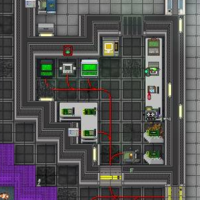 Generally, nobody stays here for any extended length of time, but occasionally, you may also see an intrepid hacker typing away at the terminal, exploring the station's DWAINE and TermOS networks. There is no vent. Not like any of these components need it. The APC for this room is on the eastern wall, right next to the fire alarm. A CompTech vending machine with computer mainboards, storage drives, ThinkDOS disks, ID scanner modules, wired network cards, and other things useful for terminal and heavy computers. Maybe it can vend other things? The AI Reset module. How'd that end up here? Packet sniffer, network carts and network cards, for various ThinkDOS signal tomfoolery. 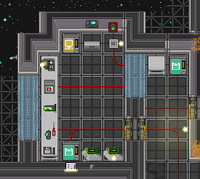 With some technical knowledge and luck, it is possible to create a DWAINE computer with every program on it, or perhaps a station-wide PDA message broadcasting system. Or maybe just an Genetics Console in the middle of the Cafeteria. Who knows what else might be possible for a skilled player to accomplish? There is no vent. Not like any of these need it...right? A CompTech vending machine with computer mainboards, storage drives, data terminal ports, ThinkDOS disks, ID scanner modules, wired network cards, and other things useful for terminal and heavy computers. Maybe it can vend other things? A empty computer frame and plenty of data terminals to put it on. There is no vent. Computer parts don't need air. 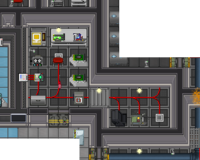 The APC for this room is on the left wall. A CompTech vending machine with computer mainboards, storage drives, ThinkDOS disks, ID scanner modules, wired network cards, and other things useful for terminal and heavy computers Maybe it can vend other things? A cute and adorable but kinda crazy Super Protector Friend. Tools and equipment such as screwdrivers, optical meson scanners and...a flash?. 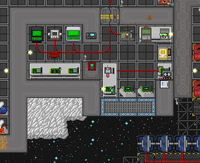 With some technical knowledge and luck, it is possible to create a DWAINE computer with every program on it, or perhaps a station-wide PDA message broadcasting system. Or maybe just an Genetics Console in the middle of the Bar. Who knows what else might be possible for a skilled player to accomplish? There is no vent. Packets don't need air. The APC for this room is in the southeast corner, next to the table. There is no vent. Computers don't need air, silly. The APC for this room is in the southwest corner, behind the table.